Monitoring temperature and relative humidity is essential in the long term preventive conservation of the historic vessel. Data loggers monitor environmental conditions to ensure a stable environment for timbers and artefacts. The Newport Medieval Ship was discovered 15 years ago, preserved in the bank of the River Usk in Newport, Wales. The vessel is the most complete surviving example of a ship from the 15th century and was disassembled and raised, along with over 1000 small finds. Archaeologists and conservators have been working steadily ever since, conserving and studying the timbers and artefacts from this unique medieval find. 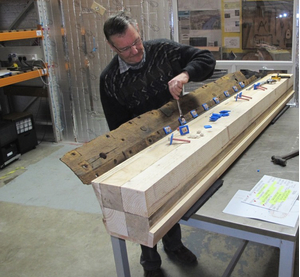 Conserved timbers and artefacts need to be stored in an environmentally controlled space. Special storage rooms within a warehouse have been built and Tinytag Ultra 2 data loggers monitor temperature and relative humidity. Six data loggers monitor the environmental conditions inside and outside the stores, in addition several data loggers are placed inside special artefact boxes containing for example the iron bolts. The recorded data is used to track changes and adjust the environmental control plant when necessary. Dehumidifiers and heating/AC equipment is adjusted according to the readings taken by the Tinytags. Dr. Toby Jones is Curator of the Newport Medieval Ship Project and is very satisfied with the performance of the Tinytags. He comments, "They are accurate, flexible and economical, and help us monitor the environment around priceless historic artefacts. The software is easy to use and the graphs are great!" Tinytag Ultra 2 temp/RH data loggers are ideal for this application - they are designed specifically for accurate indoor temp/RH monitoring. They have a lightweight, splash-proof design, and a mounting point so they can be located securely and conveniently as required. The Tinytag data logger can be seen in the background of the workshop, on the left lower orange shelf. Monitoring environmental conditions of conservation areas. Find out how to use Tinytag data loggers in museums, galleries and archives.